It starts with the packaging. Mayly Tao wants you to get one of her pink boxes, with their fancy velvet ribbons, and react the same way you would if you received a blue Tiffany box. "You know what's inside is going to be amazing," she says. Tao isn't selling jewelry or silver spoons, though. 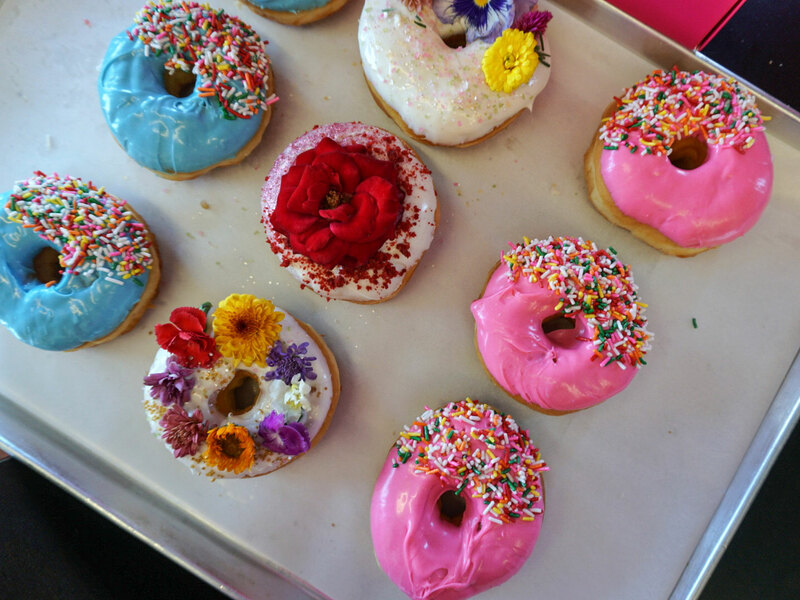 She's slinging some of the craziest and most colorful donuts L.A. has ever seen. On Monday, Tao will launch Donut Princess Los Angeles, a delivery-only service offering both classic donuts and original, calibrated-for-Instagram creations. Think purple ube donuts with rainbow sprinkles and donuts named Bling Bling, Galaxy and Unicorn Sprinkles that live up to their billing. The donut/croissant hybrids Tao calls O-Nuts come in flavors like matcha, strawberry custard and chocolate pistachio. Seasonal offerings include pumpkin-spice-latte donuts. And because this is L.A., there will be vegan donuts. For most of its donuts, Donut Princess will offer on-demand delivery, via apps like Postmates, UberEats, Grubhub, DoorDash and Amazon, from its downtown-adjacent kitchen. "The range for instant delivery is within five to 10 miles of our location," Tao says. If you want your donuts to literally spell out a message, you can also order donut letters. These must be ordered at least 24 hours in advance and can be delivered within a 12-mile radius. Plus, you can always contact Tao for custom orders, maybe a donut bouquet (perhaps even one topped with edible flowers) or a donut wall. "If you plan a few days in advance, we can arrange a delivery for you," Tao says. "Basically, anything is possible. We can get it to you anywhere [around L.A.]"
Tao is also the co-proprietor of DK's Donuts & Bakery, a popular Santa Monica donut shop her Cambodian-refugee parents opened more than 35 years ago. Tao has been working in the shop since she was a child. Even when she was going to college more than a couple hours away, studying communications at UCSD, she would find time to help her parents out at DK's. Tao's can-do attitude at Donut Princess is borne out of her experience at DK's. DK's has delivered donuts almost all the way to San Diego. Tao's often at DK's well before sunrise and will work there all morning before handling deliveries and events like weddings and office parties. DK's has 120 different kind of donuts and prides itself on never letting its display case get empty. When DK's sold out of donuts at the Los Angeles Times Food Bowl festival, Tao called multiple Ubers to get more donuts from her shop. She works hard to make things as easy as possible for her customers. "Donut Princess L.A. makes sense right now because there is something about convenience that I feel is almost imperative in our world," Tao says. "Especially in L.A. Do you want to drive 30 minutes to pick something up or do you want it to show up right in front of your door?" Plus, Tao adds, "There's always an occasion for donuts." So Tao is making Donut Princess about celebration, about being purposefully over-the-top. "It's a luxurious take on donuts, more sophisticated," she says. "We'll be using fine ingredients that are not available at DK's. We're building a brand-new team and teaching them traditional ways to bake like I learned from my parents, but we also have a new mindset. We're going to create some really crazy, outrageous, delicious donuts."